Like many of the Brothers Grimm fairy tales, “Snow White” is a deceptively simple story, if only because most of the nastier bits have been glossed over by the likes of Walt Disney and others. I’m sure you are familiar with all the touch points: Evil Queen, magic mirror, dwarves, poison apple, prince, resurrection. Snow White and the Huntsman, directed by first-time feature director Rupert Sanders, doesn’t seek to re-imagine these details so much as to place them in an epic fantasy milieu. The production is bursting with the conventions of that genre, including helicopter shots of impressive landscapes, groups of people walking up mountainous inclines, and siege warfare. It’s all painfully familiar, but here’s the surprising thing: it just works for me. 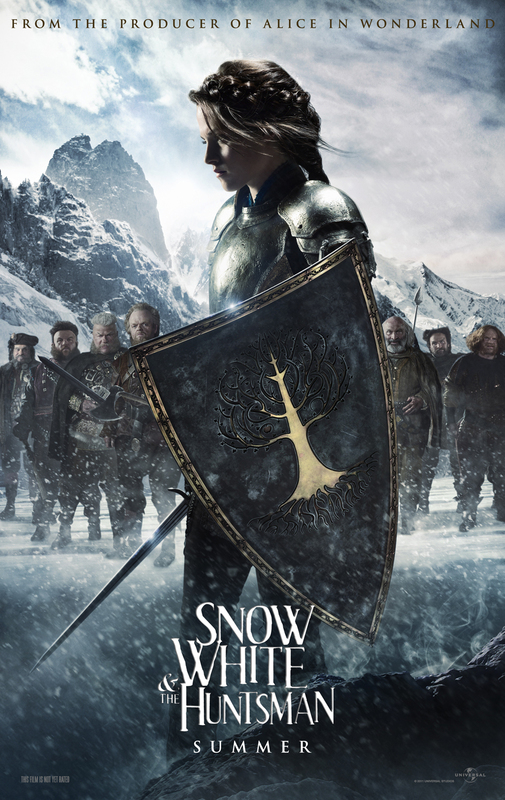 Snow White (Kristen Stewart) is now a more active protagonist, looking for a way to defeat the Evil Queen Ravenna (Charlize Theron) rather than just hiding out in the woods. This is the most welcome change to me, and Stewart does an admirable job leading her people into battle. I say admirable because Stewart does the most with a screenplay that could have served her (and the other actors) better. As the captivating Queen Ravenna, Theron runs away with most of the movie, although at times her performance borders on hysterical theatrics. Sadly, she is left rather one-dimensional, and while that dimension is played with bravado, it plays out well before the end of the film. The Huntsman (Chris Hemsworth) has an expanded role in this Snow White incarnation, and is smart enough not to try and deceive the Queen with boar guts. Hemsworth basically reprises Thor here, but the Huntsman’s boorish behavior doesn’t quite make up for missing the brash, fun-seeking Norse demigod. We also get a love triangle of sorts, with Prince William (Sam Claflin), Snow’s childhood friend, helping to lead the revolution. However, Sanders is wise to leave most of the romance out of the story. The Prince also further cements 2012 as the Year of Bows and Arrows, easily slipping next to Katniss, Hawkeye, and Merida. Thanks to technology, the dwarves are played by familiar character actors, including Ian MacShane, Ray Winstone, and Nick Frost. Again, the film’s script leaves little time to distinguish the dwarves as individual characters. The film doesn’t spend a lot of time examining thematic issues in the Snow White story, but does just enough to be incredibly frustrating. I was really excited the few times that the film insinuated a Ravenna backstory, something that may explain her being some sort of ultrafeminist/man hater, or how her beauty was used primarily has a weapon. But the film doesn’t expand on it much more than a couple throwaway lines and a flashback. Perhaps Game of Thrones has ruined me. I think what ultimately makes this version successful is the production design. The castles are high gothic, and the landscapes vary from the harsh and alien, to the comforting, and fantastical. While we don’t ever get a good sense of the geography of this land (or the kingdom’s subjects for that matter), the settings here are distinct and creatively lush with detail. The Dark Forest is especially well done, a nice mix of threats real and imagined. I also reveled in the ‘fairy land’ that channels the spirit of both the enchanted animals of the Disney universe and the holy naturalism of Miyazaki. Snow White and the Huntsman isn’t the best fantasy film ever, but it’s an example of the whole being greater than the sum of its parts. Its strengths are more than a match for its weaknesses, which made for an enjoyable viewing experience. It’s not the definitive Snow White film, but it doesn’t have to be. Snow White and the Huntsman opens today in Philly-area theaters.